Last night….Friday night….April and George took Mike Lebowski on their girls’ night out. 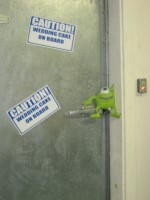 We had to leave him in the car because they don’t “serve his kind in here.” By his kind….we, of course, mean monsters. So, we packed in some cajun food (and some drinks. George: Purple Haze Louisiana beer. April: Swamp waters) and our bartender/server was great! A super nice fellow. 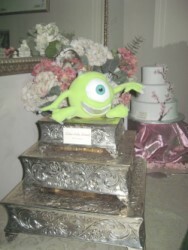 We grabbed Mike, who greeted us with his signature “wha’s up bitchessssss?!! 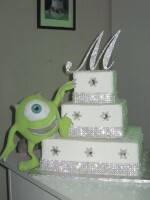 !” and took him to ….the cakerie. 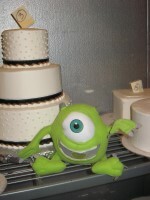 First Mike partied with the “naked cakes”…. 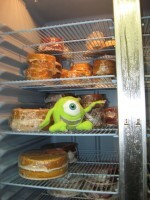 Here we see Mike with a cake waiting to fulfill its destiny. He wishes good fortune to the happy couple! 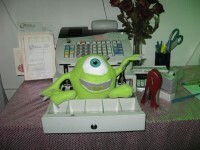 Here our loveable monster friend, Keyboard Money Mike, parties in the cash register. 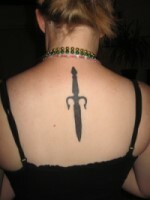 Now, on to more serious matters: April’s new tattoo. FYI for a certain loser, Apie did NOT cry AND she is better off without you. That is all for tonight folks. Don’t forget to tip your servers! Next time….try the hurricanes!